It is extremely rare for a commercial airliner to be preserved once she is withdrawn from service. Most are either scrapped outright for recycling or sent to a lonely boneyard to serve as parts hulks for other planes while rotting under a desert sun. 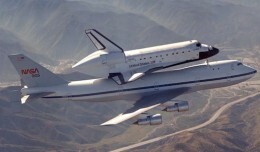 Thankfully, neither will be the case for NASA 905, the space agency’s Boeing 747 Shuttle Carrier Aircraft. After completing ground and flight tests with NASA’s test orbiter Enterprise in 1977, NASA 905 spent the next 35 years delivering and ferrying orbiters around the country. She would ultimately be the aircraft which delivered orbiters Discovery, Enterprise and Endeavour to their museum homes in Washington, D.C., New York City and Los Angeles, respectively. With the last of the spaceplanes delivered to her display site in September 2012, 905’s mission was complete and her future bleak. It was believed (and feared) she would be parked at Air Force Plant 42 with her sister ship, NASA 911, and parted out for NASA’s SOFIA program before being scrapped. Such a tragic ending, however, was not to be. The following month, 905 made a surprise return to Houston, Texas for the Wings Over Houston Airshow. The Boeing 747-100 carried an unceremonious final flight with a victory lap around Houston on December 18, 2012 and was officially retired from service shortly after. 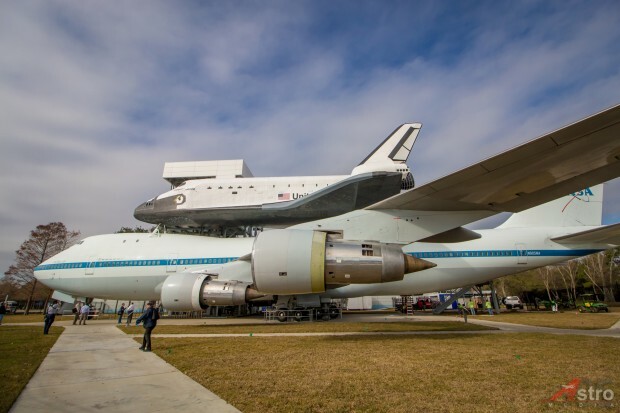 In August 2013, ownership of the aircraft was handed over to Space Center Houston during a transfer ceremony at Ellington Field, just north of Johnson Space Center. The following spring, a dedicated team of Boeing engineers converged on the airfield to disassemble the mighty 747 for relocation to her new home. 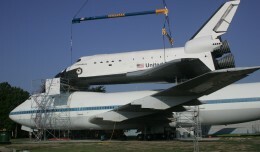 After a two-night roll through the streets in April 2014, 905 was reassembled on site at Space Center Houston and, in August 2014, mated with a full-scale orbiter mockup, Independence. The exhibit team has worked tirelessly over the last year and a half to prepare the world class exhibit for the public. Today, the public will get to experience the fruits of their labor firsthand. 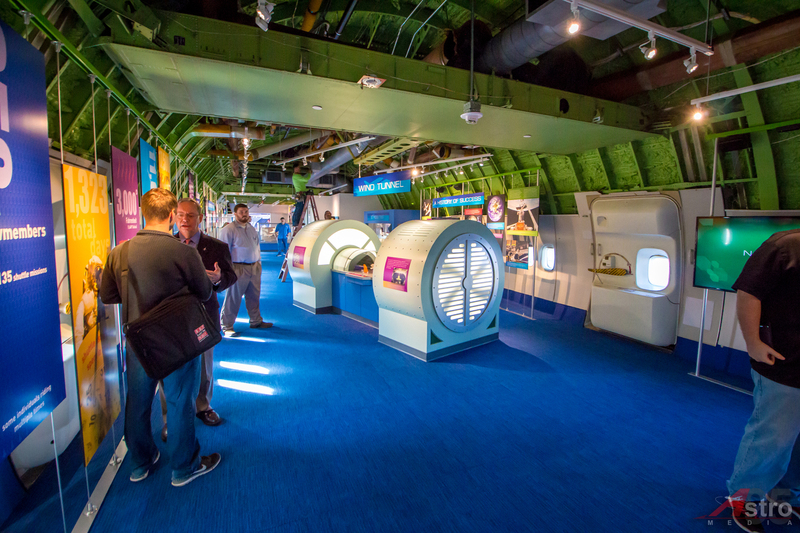 Both the 747 and orbiter mockup will be opened to visitors at Space Center Houston for a new exploration experience unlike any other. At the newly named Independence Plaza, visitors to Space Center Houston will have the unique opportunity to explore both the 747 and orbiter mockup, inside and out. 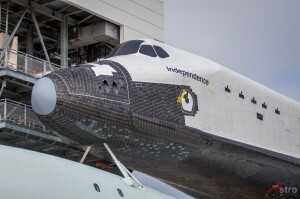 Independence, heavily refurbished in 2014 and 2015, now offers more space for visitors in her payload bay, which houses a mockup payload similar to one actually carried in space. The mockup also sports a full flight deck and middeck for public viewing. 905 herself is also accessible, with interactive and historic exhibits placed throughout the length of her cabin. While air conditioning and fire protection ducts and lines run through the cabin and carpet has been added for comfort, her walls and ceilings remain bare so visitors can see firsthand the inner workings of the 747, which was stripped of all interior furnishings to save weight for her orbiter-hauling missions. 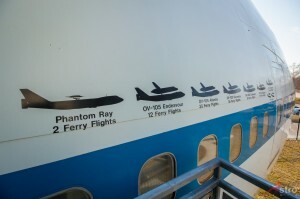 Visitors also have the option walk around and beneath the 747 and orbiter stack, which together weigh a combined 448,000 lbs. They can get an up-close look at the landing gear and even the four massive JT9D engines, which were acquired from NASA, Pratt & Whitney and Kalitta Air. Though she has taken on a new look inside, the 747’s historic legacy shines through for those who knew her as the Shuttle Carrier Aircraft. As NASA undertook wake vortex studies in 1974, they began looking for a large airliner to use in airborne tests and eventually carry the space shuttle, which was under development at that time. That July, they were able to purchase a gently used 747, registered N9668, from American Airlines. Like all Boeing 747s, N9668 was born at the Boeing Everett Factory near Seattle, WA. She was the 86th 747 to roll off the assembly line and was delivered to American Airlines in October 1970. After two years of service in NASA’s airborne science program, the 747, now reregistered as N905NA, or “NASA 905”, returned to her birthplace to undergo a massive overhaul for a new mission, which would firmly solidify her place in aviation history. 905’s next endeavor was the brainchild of NASA engineer John Kiker, although she was not the agency’s first choice for the job. With the development of NASA’s space shuttle in full swing, the space agency needed a method of deploying a test orbiter in midair for flight tests, as well as future transportation of the orbiters to their planned Kennedy Space Center home from alternate landing sites. A cross-country trip over land was deemed impossible and a barge trip over water too time consuming. It was then that John Kiker had a revolutionary idea – the orbiters would be piggybacked atop a modified jumbo jet. The aircraft completed her career in 2012, having accrued approximately 11,000 hours on her frame; a miniscule number for an aircraft approaching 43 years of age. Despite being disassembled, reassembled and now sitting idly on permanent display, NASA 905 remains flightworthy; a true testament to the work put into the aircraft for the last four decades by personnel from NASA, Boeing and Space Center Houston. 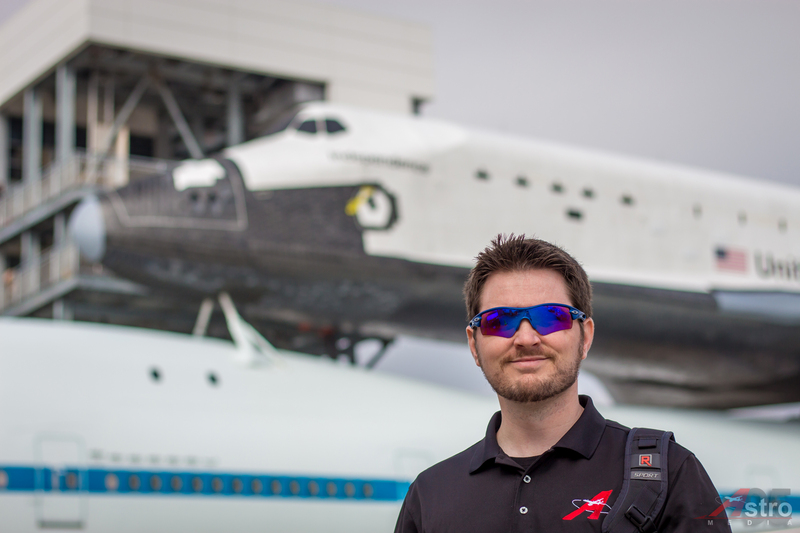 Nathan Moeller is a native Texan and lifelong aviation enthusiast who collaborates with aviation and spaceflight organizations to provide behind-the-scenes photos and videos. Currently working as an aviation training development specialist in Houston, he offers an inside look at rarely scene aviation operations. His experience includes imaging operations with the space shuttle, 747-8 and 777 freighters, and outsized cargo aircraft such as NASA’s Super Guppy and the massive Antonov An-225. You can follow his organization on Twitter at @Astro95Media. All photos by the author. Full gallery is below. As hundreds of onlookers watched, the 171,860 pound (86 ton) space shuttle Independence replica gently rose off its mobile transporter and onto the the NASA905 Shuttle Carrier Aircraft. NASA 905 will be the centerpiece of a new $12 million exhibit at Johnson Space Center, complete with a mock-up of a space shuttle on its back. The gallery does not work, in Firefox or Chrome with all Ad Blockers on or off. Clicking on a picture just reloads the page. There are over 300 detected ad request and over 100 content requests when they are left off.